No, I am not being sponsored for this post. I just love sharing good finds with you! I have always had a hard time finding a decent eyeliner. Liquid, pencil, gel. I've always had a hard time finding one I liked...and one that lasted. I really like one I got in my Birchbox a couple months ago - but $15 (plus shipping) for eye liner can take a hike. I must say, I've fallen in love! Maybelline's Stiletto liquid eyeliner is 2 thumbs WAY up in my book. It's thin enough to get a nice sophisticated look & obviously, you can make it as thick as you'd like. The reason I really like it is that it glides on SO amazingly. It also lasts ALL day. Yup. Early AM to late PM. It's great! What's your "go to" eyeliner? I want to try this now! 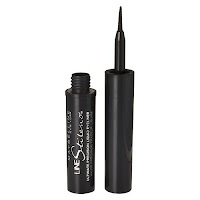 I've been looking for a great liquid eyeliner but haven't found any that I've loved yet! Oooo this is one of the ones I love and use! It works so well and easily makes a nice line!! I have Revlon liquid gel which is nice too! I've tried them all! I love MAC cream eyeliner in the pots. I wear the Covergirl Perfect Point Plus Eyeliner (it is retractable. no sharpening) on the water line. On the top, I wear liquid. Either Maybelline or elf. i love elf's cream eyeliner, but i'd be willing to give this a shot! I'm too clumsy to use liquid liner!